While Toomas Topi Heikkinen has wrapped up the 2013 Global RallyCross Driver’s Championship and Ford Motor Company has wrapped up the 2013 Global RallyCross Manufacturer’s Championship, the final two races promise to be packed with the same adrenaline fueled racing action that we have seen all season. 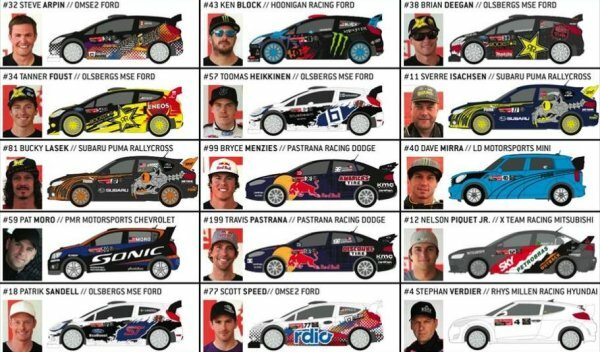 In addition to the regulars like Heikkinen, Tanner Foust, Ken Block, Brian Deegan, Sverre Isachsen and more, the Charlotte race will feature some new faces that we haven’t seen this season and some others who have been in and out during the 2013 season. Finally, there is some big news from the Mini Cooper Racing camp as Dave Mirra – who has made a name for himself behind the wheel of a Subaru Puma Rallycross Impreza WRX will pilot Liam Doran’s Mini. The biggest news from this weekend’s Global RallyCross event is the debut of the new Chevrolet Sonic rallycross program with Pat Moro behind the wheel. Moro was a series regular in his Subaru race car but after little success in 2012, Moro hasn’t been around during the 2013 season until now. Next up, Stephan Verdier will return to the cockpit of a Rhys Millen Racing Hyundai Veloster this weekend. Verdier ran with Millen in 2012 but when Hyundai pulled their factory backing from the team, Millen left the sport and that left Verdier without a ride. Stephan returned to the GRC at the LA X Games in his self-owned and unsponsored Subaru Impreza WRX while Millen also returned with the Velosters. David Sterckx teamed up with Millen for the LA race but Verdier will climb back into the car in which he had a fair amount of success last season for the Charlotte race. Nelson Piquet Jr will also be competing this weekend in the same Mitsubishi Lancer Evolution X that he drove in Brazil and Loudon. After being in and out all season due to other commitments, Travis Pastrana and Bryce Menzies will both be in their Dodge Dart rallycross cars which means that the Dodge team will have their best chance at a strong showing with their two strongest drivers in action. Finally, in a surprising move, former Subaru racer Dave Mirra will be racing in Liam Doran’s Mini Cooper rallycross car. Doran dominated at the two Munich events but after a poor showing in Loudon, Liam has turned to Mirra to drive the Mini. Based on the struggles by Mirra in the Subaru this season, a move to a car that has shown some success could only be good for the X Games legend. In terms of the regulars, Ken Block will be racing his Hoonigan Racing Ford Fiesta, Brian Deegan, Tanner Foust, Topi Heikkinen and Patrik Sandell will be racing in the Olsberg MSE Ford Fiestas, Steve Arpin and Scott Speed will be running the OMSE2 Ford Fiestas and Bucky Lasek and Sverre Isachsen will be the only drivers in the field racing in Subaru entries. The Charlotte Global RallyCross race will run Sunday September 22nd at 4:30pm EST and you can catch the action on ABC.